Conveniently located off I-15, this Idaho Falls hotel features an indoor pool and hot tub and serves a daily hot breakfast. The hotel offers a free transfer service from Idaho Falls Regional Airport, which is 6 minutes’ away. A flat-screen cable TV, a microwave and a refrigerator are included in all of the spacious rooms and suites at Hampton Inn Idaho Falls/Airport. The air conditioned rooms and suites feature free Wi-Fi, a desk and tea and coffee-making facilities. 24-hour reception and an on-site business centre are offered at Idaho Falls/Airport Hampton Inn. Guests can also workout in the hotel fitness centre. Vending machines featuring snacks and drinks are located on site. Cedar Park Golf Course is 25 minutes’ drive from this hotel. Yellowstone National Park and Craters of the Moon National Monument are less than 70 miles away. 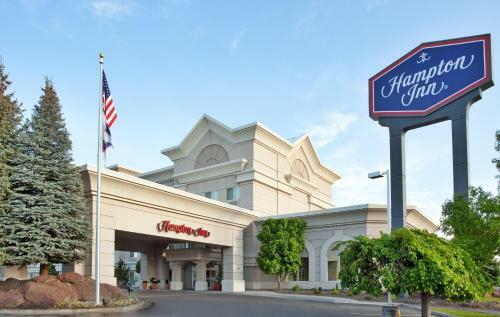 the hotel Hampton Inn Idaho Falls / Airport so we can give you detailed rates for the rooms in the desired period.